A stay at Caribe Royale All-Suite Hotel places you in the heart of Orlando, a 7-minute drive from Orlando Vineland Premium Outlets and 11 minutes from Aquatica. This 4-star resort is 4.3 mi (6.9 km) from Disney Springs® and 5.6 mi (9 km) from Disney's Hollywood Studios®. Make yourself at home in one of the 1335 air-conditioned rooms featuring microwaves and LCD televisions. Complimentary wireless Internet access keeps you connected, and cable programming is available for your entertainment. Private bathrooms with shower/tub combinations feature designer toiletries and hair dryers. Conveniences include laptop-compatible safes and desks, as well as phones with free local calls. Relax at the full-service spa, where you can enjoy massages, body treatments, and facials. You're sure to appreciate the recreational amenities, which include 2 outdoor swimming pools, 3 spa tubs, and a waterslide. This resort also features complimentary wireless Internet access, concierge services, and an arcade/game room. If you're planning a day at a nearby theme park, you can hop on the complimentary shuttle. Grab a bite to eat at one of the resort's 3 restaurants, or stay in and take advantage of the 24-hour room service. Snacks are also available at the 2 coffee shops/cafés. Relax with a refreshing drink from the poolside bar or one of the 2 bars/lounges. Buffet breakfasts are available for a fee. Featured amenities include a 24-hour business center, limo/town car service, and express check-out. Planning an event in Orlando? This resort has facilities measuring 150000 square feet (13935 square meters), including a conference center. Self parking (subject to charges) is available onsite. Waterfalls cascade from rocks high above a 250,000-gallon pool, with a 75-foot (23-meter) serpentine waterslide at this Orlando hotel. A fitness center is in the pool courtyard. An additional pool, 2 spa tubs, children's pool, and water playground are onsite. A series of spa services and treatments are available, including manicures and pedicures, massage, and 3 treatments rooms, including a couples treatment room (advanced reservations required for spa services). Other amenities include a lighted tennis court, lighted basketball court, activity desk, and gift shop. Enjoy a buffet breakfast cooked daily (surcharge). Complimentary scheduled shuttles get guests to Lake Buena Vista Factory Stores (once per day). Shuttles to the Walt Disney Ticket & Transportation Center and Orlando Vineland Premium Outlets, are included in the resort fee and require advanced reservations. A convention center, including 150,000 square feet (13,935 square meters) of meeting space and a 40,000-square-foot (3,716-square-meter) ballroom, can accommodate up to 4,400 guests. Catering and small conference rooms are available. A self-service business center offers copying, faxing, scanning, and computer workstations (surcharges). WiFi access is available in public areas (included in resort fee). The Venetian Chop House - Contemporary cuisine including signature steaks, chops, fresh seafood and reserve wine selections. The Venetian Chop House is located on the lower level of the Reception Building. Serving dinner Monday through Saturday 5:30 pm to 10:00 pm. Reservations are recommended. The Tropicale - Traditional family fare are served for breakfast, lunch, and dinner in a comfortable setting complete with indoor palm trees. Menu items include sandwiches, burgers, pasta, and meat and poultry dishes. Calypso's - This poolside dining venue consists of traditional tropical drinks and hot meals, including burgers and sandwiches. It serves snacks and lunch. Café 24 - Open seven days a week, Café 24, with its bistro theme, offers late-night dining or takeout anytime. Menu items include pizza, salads, and deli favorites. The Loft - Situated off the hotel lobby, The Loft has a rich wood motif, widescreen TV, cocktails, and snacks. Java's Coffee Cafe - Located poolside, lobby level, in Tower II. Offers freshly brewed coffee, specialty coffee drinks, freshly baked cookies and muffins, hand-dipped ice cream, and sundries. A 250,000-gallon outdoor freeform pool—flanked by towering rocks with a cascading waterfall—and a 75-foot serpentine waterslide create a tropical playground. A fitness center in the pool courtyard provides trained staff and an array of cardio and weight equipment. Bicycles are available for rent from our fitness center along with fishing pole rentals for our recently added catch and release fishing pier. A 1.5 mile bicycle, jogging walking path surrounds our property. 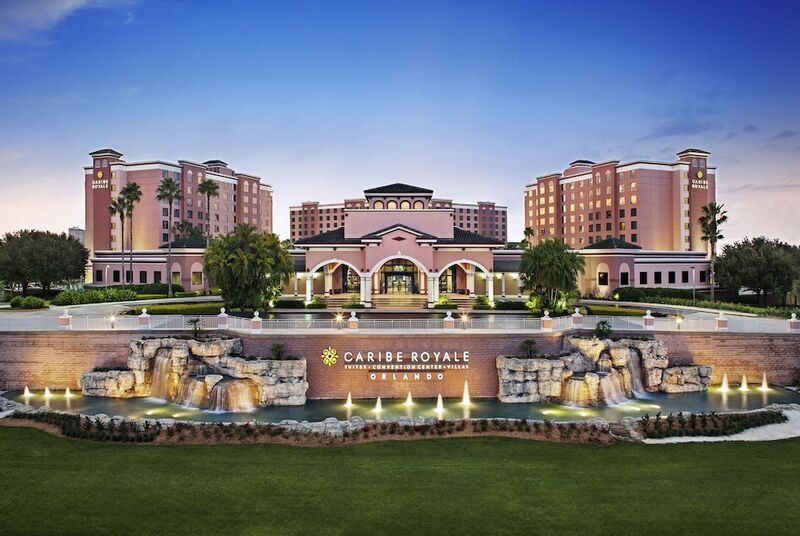 For children, Caribe Royale has a separate pool and interactive water playground, as well as a video-game room. Guests can play on a lighted tennis court and a lighted basketball court. Recreational activities listed below are available either on-site or near the hotel; fees may apply. Island Spa is the perfect place to pamper your senses, relax, and melt away the stress after a long day of meetings or enjoying the local theme parks. Along with 5-star service from highly skilled professionals, the signature treatments and exclusive Privai products will envelop guests in a sensory, tropical experience. Guests can enjoy from an array of massages, such as hot stone, prenatal, and Swedish, to rejuvenating body treatments.